KUALA LUMPUR (Aug 28): DRB-Hicom Bhd fell as much as three sen or 2.3% after the diversified entity reported a first quarter net loss at RM19.72 million on lower revenue from a year earlier. The latest financials prompted analysts to downgrade estimates for DRB-Hicom (fundamental: 0.3; valuation: 2.4), which owns Malaysia's national car company Proton Holdings Bhd. DRB-Hicom shares fell to their lowest so far today at RM1.29. At 9.54am, the stock pared losses at RM1.30 with 129,400 shares done. At 10.19am, the shares changed hands at RM1.29 with 386,600 units transacted. At 10.20am, the FBM KLCI rose 13.58 points or 0.9% to 1,615.27. 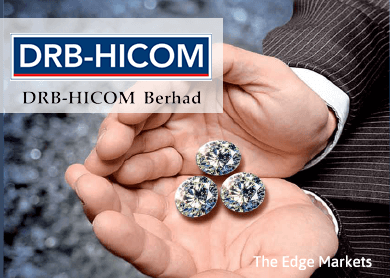 Yesterday, DRB-Hicom said it posted a net loss of RM19.72 million in the first quarter ended June 30, 2015 (1QFY16) from a net profit of RM107.84 million a year earlier. Revenue fell to RM2.95 billion from RM3.72 billion. In a note today, Hong Leong Investment Bank Bhd analyst Daniel Wong said the research firm cut its FY16 to FY18 earnings forecast for DRB-Hicom by up to 42.6%. The downgrade came with a lower target price of RM1.72 for DRB-Hicom shares from RM2.62 previously. Wong, who maintained Hong Leong's "buy" call for DRB-Hicom shares, said the earnings downgrade took into consideration DRB-Hicom's lower vehicles sales volume and average prices. "Proton is banking on its upcoming collaboration with Suzuki for new model development and market expansion by 2016. The upcoming models due for replacement include Saga, Persona and Perdana (based on Honda Accord platform), which may excite the market by end 2015." he said.